It’s been a while since I discussed the core issue which has done so much harm to higher education: the student loan scam (so long, in fact, that a reader asked me to explain what I meant by it, and so here we are). When I first started this blog about 5 years ago, the total amount of student loans was under a trillion dollars, but now it’s around $1.5 trillion. I could be off a bit, but with numbers this large, it’s not worth tracking another 100 billion here or there. Amounts this size cannot be legitimately paid back, and we now have far more people with student loans than we have students in our higher education system. Some say the reason for these unpayable loans is the economy, and while there’s some truth to such a claim, there are underlying issues which would give us over a trillion dollars in loans regardless of how booming the economy might be. So let’s go over what happened in some detail. First, a few decades ago the government noticed that people with college degrees made more money than people without such things, and so determined that degrees meant more money. This is, of course, flawed thinking, and it’s difficult to believe the people running our government could be this stupid and not know what they were really doing. For example, it’s a simple matter to determine people who wear more than an ounce of gold jewelry have more money than people who do not, but I’ve seen no push by the government to give gold jewelry to everyone…if our government were really run by morons, they’d be handing out gold jewelry, because the reasoning would be the same, right? In any event, based on this observation, the government decided to back loans which paid for tuition. Naturally, Federal money has Federal strings attached to it, and the strings here involved the following: the loans could only go to students seeking degrees, and the loan money could only go to legitimate schools. “Legitimate” was determined by the government, which (foolishly) decided that only the regional accrediting bodies which were already in place could properly determine the legitimacy of a school. Since the Federal government backed the loans, they had sufficient force to see to it that these loans would be paid back; you cannot escape these loans through bankruptcy, and even if the loan money was fraudulently granted, you still have to pay it back. This was the first step of the scam: opening up the Federal loan money cash spigot to certain college students, namely those who wanted a degree. —“the box” refers to the box on the registration form certifying the student wants a degree. Now, the “student seeking a degree” string was easily avoided. All a student need do is check a box saying he wants a degree, and it’s solved. In times past, when higher education was cheap (even Harvard’s tuition could be paid via a minimum wage job decades ago), it was fine to take just a few college courses…but now everyone must pursue a degree. It’s just a box to click off, and there’s no penalty for lying. The second string attached leads to the next piece of the student loan scam. This issue is accreditation. Accreditation is a 19th century concept, and it formed then because schools in the United States wanted to become better at what they do. The old rules for accreditation were simple, and about education. Old accreditation is riddled with good faith assumptions, because it was completely voluntary, and was never intended to be about money, certainly not money measured by the hundreds of billions of dollars. Today’s accreditation, responsible for today’s victims of higher education, cares nothing about education, and simply is a rubber stamp to allow the student money to flow. Schools systematically violate even the fairly limp rules of accreditation today and it doesn’t matter: accreditation is only removed for schools which don’t pay their accreditation fees (and this is the only violation I’ve ever seen of the many accreditation rules—any claim that our leaders in higher education are simply incompetent must address why they never, never, violate this rule). These two issues explain much of what happened. If accreditation was legitimate, or the Federal government wasn’t backing the student loans so anyone can get them, we wouldn’t have $1.5 trillion in debt for college tuition. Past this point, it’s all details, but I’ll address some of them as well. The tuition loan money available, for example, is based on the cost of tuition. Thus we have a vicious cycle: the school raises tuition to whatever it can, and the loan is automatically and commensurately raised to cover it. So the school may as well raise tuition some more, and so tuition goes up some more. This relationship is well known, well documented…but the Federal government won’t stop it because they keep trusting accreditation to be legitimate. Suckers. There’s absolutely no penalty to the school if it takes the loan money under fraudulent circumstances. Ok, yes, if the school literally steals billions, the Federal government will shut it down (even as accreditation says “they’re legit because they paid us to say they’re legit!”). This means your typical “leader” in higher education is just there to plunder, and my blog has many examples of these pirates irresponsibly looting a school (my own favorite is the Poo Bah who used the school to build his personal 4 star restaurant, though usually the money is stolen through real estate deals). The sheer size of the fraud cannot be underestimated. It isn’t simply that we have schools with wide swaths of fraudulent coursework, or submitting fraudulent paperwork asserting the courses are legitimate knowing full well accreditation doesn’t even care. We also have schools which use student information to sign them up for classes (and huge loans) the student doesn’t even know about. Years later, when the student gets the bill…they’re still on the hook and there’s no recourse. If the student loan money weren’t backed by the government, it’d be backed by private banks who would take a look at the school to see if a legitimate education was really happening there. Instead, we have schools with ridiculously low graduation rates, even 0.6% is considered pretty good…because all that matters is sucking in students and extracting that money, nothing else. In any event, this is the basic structure of the student loan scam: a clueless government loans infinite money to any person willing a to check a box, to any school willing pay the money to an accreditor, which will allow it to accept student loan money. After a generation of this plundering, kids see their parents were harmed greatly by higher education and are starting to shy away from going to college, thank goodness. After decades of amazing growth, college enrollments are dropping. Some schools are putting up climbing walls and otherwise turning their campuses into resorts for the students. I don’t see this working out in the long run, and even the short run is unlikely. Some schools are expanding their graduate programs, utterly destroying the lives of the students whose lives were already being destroyed by the loans for their undergraduate degrees. Again, this is a short term solution, though for a few more years I reckon the plundering can continue as before. Finally, some schools are working with the public school system to simply “guide” students to college right out of high school, with a goal of 100% high-school-to-college “success.” They’re focusing in particular on students from families where nobody went to college—in other words, they’re focusing on the ignorant and most vulnerable. While vile and pure evil to exploit kids like this, this tactic should also work for a little while…but I suspect it won’t take a generation before this scheme, too, falls apart, and it can’t possibly last for longer than a generation. A long term plan for success, namely restoring integrity to higher education in general, possibly through re-legitimizing accreditation, is not being discussed…the money is still too easy to get through the student loan scam, after all. Perhaps later I’ll discuss some more how we can fix higher education so it won’t be such a creator of victims and exploiter of the young. For now, though, anyone who reads this blog now knows the basic idea how the student loan scam works. 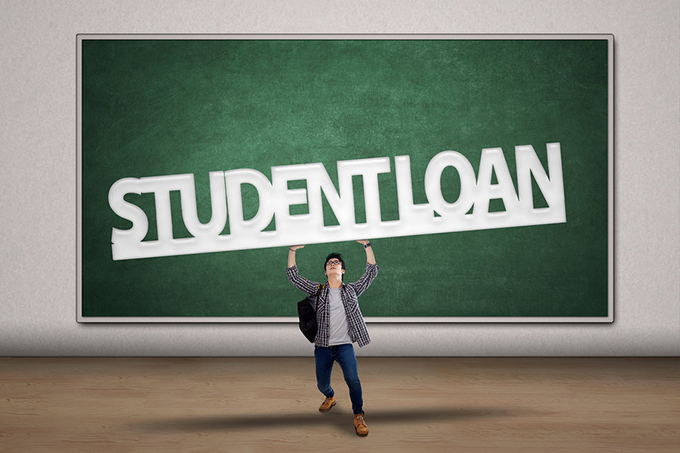 Every college and university in this country, from Harvard to the lowliest community college, engages in this scam to some extent, so please warn your children thinking about taking out a loan for college tuition.